Members are invited to buckle up for a thrilling, high-speed adrenaline-fuelled boat tour of the Thames, followed by a champagne experience up in the London skies at The View from the Shard. If you’ve ever fancied the James Bond lifestyle, this is the ballot for you. Start the afternoon off with an adrenaline-fuelled sightseeing tour of the Thames by high-speed boat with ThamesJet, before you hang up the waterproofs and head for the skies, with a champagne experience at The View from the Shard. This prize is available to twelve lucky Possibilities members plus guest, and it promises to be an afternoon you’ll never forget. Thanks to ThamesJet, you can enjoy a 50-minute sightseeing and high-speed aquabatics tour of the Thames. Take in the iconic sights of the capital including the Houses of Parliament and Elizabeth Tower that houses the world famous Big Ben, the London Eye, The Shard and HMS Belfast to name a few – the sights really do come thick and fast on this stretch of the river. So, sit back (hold on!) and enjoy the view as you pass under some of the London’s great bridges including the Millennium Bridge and Tower Bridge. Then you’ll speed your way around Canary Wharf. 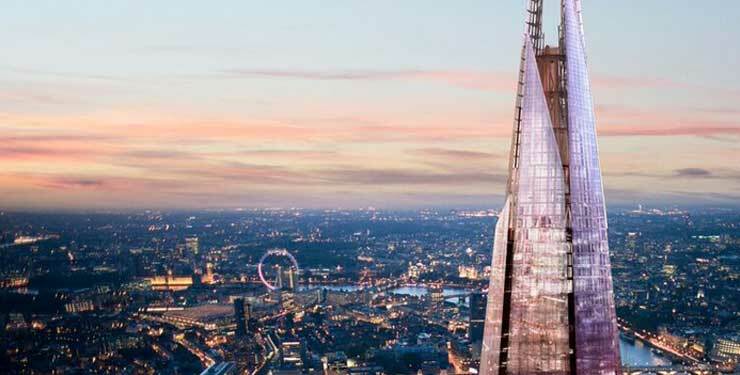 Once back on dry land, you’ll be treated to the amazing View from The Shard experience, at the top of western Europe’s tallest building. Designed by master architect Renzo Piano, The Shard has redefined London’s skyline and has quickly established its place as a dynamic symbol of the capital city. At a height of up to 800ft or 244m – almost twice the height of any other vantage point in London, you can experience unrivalled 360 degree views over the city, for up to 40 miles on a clear day. The extraordinary high-speed lift will take you to level 68 in just 60 seconds. There you can enjoy spectacular panoramic views of the capital from our Level 69 observation deck, unwind with a glass of champagne, or share a moment with a loved one spotting London’s famous landmarks from our open-air sky deck on Level 72. You can also explore the capital's past, present, and future courtesy of our high-tech, fully interactive digital telescopes and multimedia guides, enabling visitors to experience the entire city like never before. Twelve Possibilities members and your guest will hop on board and hold tight for an adrenaline-fuelled ThamesJet high-speed boat tour, followed by a champagne View from the Shard experience, on Tuesday 21 May 2019. ThamesJet experience departs from Westminster Pier, boarding point F, Victoria Embankment, London SW1A 2JH. The View from the Shard, Joiner Street, London, SE1 9QU. We want everyone to enjoy their experience, so please check the ThamesJet safety information below to ensure this experience is suitable for you before entering the ballot. The View from the Shard offers a step-free experience with accessible lifts throughout the attraction. Lifts take you from street level to the first floor, where ticketing and security procedures take place. Accessible lifts then take you to Level 68. At Level 68 you are able to take a lift to the viewing platform on Level 69, and the open air Skydeck on Level 72. The viewing platforms do not have fixed seating, but should you require a chair we do supply them on request. Guests may borrow wheelchairs if needed, to ensure their visit is as comfortable as possible. Winners requiring additional assistance, should notify the Possibilities Events Team prior to the day. The ThamesJet boat experience departs at 12pm on Tuesday 21 May 2019. Guests will need to arrive 20 minutes before for a safety briefing. Waterproof clothing and lifejackets will be provided. No late admissions will be possible for the ThamesJet experience. The last entry to The View from the Shard will be at 6pm. Winners will be notified within 48 hours of the ballot closing, please double check your spam/junk mail boxes as we wouldn't want you to miss out!